Albinism is an inherited condition present at birth, characterized by a lack of pigment that normally gives color to the skin, hair, and eyes. Many types of albinism exist, all of which involve lack of pigment in varying degrees. The condition, which is found in all races, may be accompanied by eye problems and may lead to skin cancer later in life. Albinism is a rare disorder found in fewer than five people per 100,000 in the United States and Europe. Other parts of the world have a much higher rate; for example, albinism is found in about 20 out of every 100,000 people in southern Nigeria. There are 10 types of the most common form of the condition, known as "oculocutaneous albinism," which affects the eyes, hair, and skin. In its most severe form, hair and skin remain pure white throughout life. People with a less severe form are born with white hair and skin, which turn slightly darker as they age. Everyone with oculocutaneous albinism experiences abnormal flickering eye movements (nystagmus) and sensitivity to bright light. There may be other eye problems as well, including poor vision and crossed or "lazy" eyes (strabismus). The second most common type of the condition is known as "ocular" albinism, in which only the eyes lack color; skin and hair are normal. There are five forms of ocular albinism; some types cause more problems-especially eye problems-than others. Every cell in the body contains a matched pair of genes, one inherited from each parent. These genes act as a sort of "blueprint" that guides the development of a fetus. Albinism is an inherited problem caused by a flaw in one or more of the genes that are responsible for directing the eyes and skin to make melanin (pigment). As a result, little or no pigment is made, and the child's skin, eyes and hair may be colorless. In most types of albinism, a recessive trait, the child inherits flawed genes for making melanin from both parents. Because the task of making melanin is complex, there are many different types of albinism, involving a number of different genes. Symptoms of albinism can involve the skin, hair, and eyes. The skin, because it contains little pigment, appears very light, as does the hair. Although people with albinism may experience a variety of eye problems, one of the myths about albinism is that it causes people to have pink or red eyes. In fact, people with albinism can have irises varying from light gray or blue to brown. (The iris is the colored portion of the eye that controls the size of the pupil, the opening that lets light into the eye.) If people with albinism seem to have reddish eyes, it's because light is being reflected from the back of the eye (retina) in much the same way as happens when people are photographed with an electronic flash. They may be very far-sighted or near-sighted, and may have other defects in the curvature of the lens of the eye (astigmatism) that cause images to appear unfocused. They may have a constant, involuntary movement of the eyeball called nystagmus. They may have problems in coordinating the eyes in fixing and tracking objects (strabismus), which may lead to an appearance of having "crossed eyes" at times. Strabismus may cause some problems with depth perception, especially at close distances. They may be very sensitive to light (photophobia) because their irises allow "stray" light to enter their eyes. It's a common misconception that people with albinism shouldn't go out on sunny days, but wearing sunglasses can make it possible to go outside quite comfortably. In addition to the characteristically light skin and eye problems, people with a rare form of albinism called Hermansky-Pudlak Syndrome (HPS) also have a greater tendency to have bleeding disorders, inflammation of the large bowel (colitis), lung (pulmonary) disease, and kidney (renal) problems. It's not always easy to diagnose the exact type of albinism a person has; there are two tests available that can identify only two types of the condition. Recently, a blood test has been developed that can identify carriers of the gene for some types of albinism; a similar test during amniocentesis can diagnose some types of albinism in an unborn child. A chorionic villus sampling test during the fifth week of pregnancy may also reveal some types of albinism. The specific type of albinism a person has can be determined by taking a good family history and examining the patient and several close relatives. The "hairbulb pigmentation test" is used to identify carriers by incubating a piece of the person's hair in a solution of tyrosine, a substance in food which the body uses to make melanin. If the hair turns dark, it means the hair is making melanin (a "positive" test); light hair means there is no melanin. This test is the source of the names of two types of albinism: "ty-pos" and "ty-neg." The tyrosinase test is more precise than the hairbulb pigmentation test. It measures the rate at which hair converts tyrosine into another chemical (DOPA), which is then made into pigment. The hair converts tyrosine with the help of a substance called "tyrosinase." In some types of albinism, tyrosinase doesn't do its job, and melanin production breaks down. There is no treatment that can replace the lack of melanin that causes the symptoms of albinism. Doctors can only treat, not cure, the eye problems that often accompany the lack of skin color. Glasses are usually needed and can be tinted to ease pain from too much sunlight. There is no cure for involuntary eye movements (nystagmus), and treatments for focusing problems (surgery or contact lenses) are not effective in all cases. Amino acids — Natural substances that are the building blocks of protein. The body breaks down the protein in food into amino acids, and then uses these amino acids to create other proteins. The body also changes amino acids into melanin pigment. Astigmatism — An eye condition in which the lens doesn't focus light evenly on the retina, leading to problems with visual sharpness. Carrier — A person with one normal gene and one faulty gene, who can pass on a condition to others without actually having symptoms. DNA — The abbreviation for "deoxyribonucleic acid," the primary carrier of genetic information found in the chromosomes of almost all organisms. The entwined double structure allows the chromosomes to be copied exactly during cell division. DOPA — The common name for a natural chemical (3, 4-dihydroxyphenylalanine) made by the body during the process of making melanin. Enzyme — A protein that helps the body convert one chemical substance to another. Gene — The basic unit of genetic material carried in a particular place on a chromosome. Genes are passed on from parents to child when the sperm and egg unite during conception. Hairbulb — The root of a strand of hair from which the color develops. Hermansky-Pudlak Syndrome (HPS) — A rare type of albinism characterized by a problem with blood clotting and a buildup of waxy material in lungs and intestines. Melanin — Pigment made in the hair, skin and eyes. Nystagmus — An involuntary back-and-forth movement of the eyes that is often found in albinism. 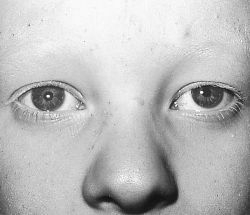 Strabismus — Crossed or "lazy" eyes, often found in albinism. Tyrosinase — An enzyme in a pigment cell which helps change tyrosine to DOPA during the process of making melanin. Tyrosine — A protein building block found in a wide variety of foods that is used by the body to make melanin. Crossed eyes (strabismus) can be treated during infancy, using eye patches, surgery or medicine injections. Treatment may improve the appearance of the eye, but it can do nothing to cure the underlying condition. Patients with albinism should avoid excessive exposure to the sun, especially between 10 a.m. and 2 p.m. If exposure can't be avoided, they should use UVA-UVB sunblocks with an SPF of at least 20. Taking beta- carotene may help provide some skin color, although it doesn't protect against sun exposure. In the United States, people with this condition can expect to have a normal lifespan. People with albinism may experience some social problems because of a lack of understanding on the part of others. When a member of a normally dark-skinned ethnic group has albinism, he or she may face some very complex social challenges. One of the greatest health hazards for people with albinism is excessive exposure to sun without protection, which could lead to skin cancer. Wearing opaque clothes and sunscreen rated SPF 20, people with albinism can safely work and play outdoors safely even during the summer. Genetic counseling is very important to prevent further occurrences of the conditon. National Association for the Visually Handicapped. Larry: A Book for Children with Albinism Going to School. New York: National Association for the Visually Handicapped. American Foundation for the Blind. 15 W. 16th St., New York, NY 10011. (800) AFB-LIND. Hermansky-Pudlak Syndrome Network, Inc. One South Road, Oyster Bay, NY 11771-1905. (800) 789-9477. 〈appell@theonramp.net〉. National Organization for Albinism and Hypopigmentation (NOAH). 1530 Locust St., #29, Philadelphia, PA 19102-4415. (800) 473-2310. http://www.albinism.org. a hereditary disorder, usually transmitted as an autosomal recessive trait, in which there is partial or total absence of pigment in the skin, hair, and eyes (oculocutaneous albinism) or in the eyes alone (ocular albinism), caused by defective or absent function of the enzyme tyrosinase. It is imperative that individuals affected with albinism be taught how to protect themselves from the harmful effects of the sun. A group of inherited (usually autosomal recessive) disorders with deficiency or absence of pigment in the skin, hair, and eyes, or eyes only, resulting from an abnormality in melanin production. See: ocular albinism, piebaldism. 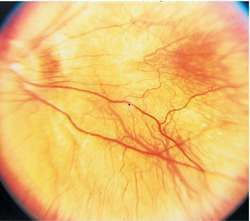 ocular albinism that in which skin and hair pigmentation is virtually or wholly normal, with ocular abnormalities varying by type. oculocutaneous albinism (OCA) a human albinism occurring in ten types, all having in common decreased melanotic pigmentation of the hair, skin, and eyes, hypoplastic foveas, photophobia, nystagmus, and decreased visual acuity. 1. Any of several inherited conditions characterized by the reduction or absence of the pigment melanin in a person or animal, resulting in lack of pigmentation in the eyes, skin, and hair. Humans with albinism usually have vision problems. 2. Lack of chlorophyll in a plant or plant part, resulting in a pale color. a rare inherited disorder characterized by a lack of melanin in the skin. Total albinos have pale skin that does not tan, white hair, pink eyes, nystagmus, astigmatism, and photophobia. Albinos are prone to severe sunburn, actinic dermatitis, and skin cancer. Compare piebald, vitiligo. A group of inherited (usually autosomal recessive) disorders with deficiency or absence of pigment in the skin, hair, and eyes, or eyes only, due to an abnormality in production of melanin. Congenital absence of the normal body colouring pigment MELANIN. This is formed from tyrosine by the action of an enzyme tyrosinase present in cells called melanocytes. There are two kinds of albinism, tyrosinase positive and tyrosinase negative, due to mutations in different GENES that are not ALLELES. Albinism is an AUTOSOMAL RECESSIVE inheritance. Because the two mutations are on unrelated genes, people HETEROZYGOUS for both of the abnormal genes have normal colouring. For the same reason, two albino parents do not necessarily have albino children. Tyrosinase negative people are completely free of pigment, have pure white hair, pink-white skin and blue eyes and usually have visual problems. Tyrosinase positive people are less severely affected. Albinos often have defective eyesight from pigment deficiency in the eyes, and usually suffer from NYSTAGMUS. Fig. 20 Albinism . Blockage in tyrosine metabolism. pinkish skin in which the pigment-containing cells (MELANOPHORES) are present but contain little or no melanin. The pinkish coloration comes from the underlying blood vessels. eyes with a deep red pupil and pink iris, both due to a lack of normal pigmentation and heavy vascularization. photophobia (fear of light) brought on by excess light entering the eye and reflecting onto the retina. Albinos usually wear dark glasses. Albinism is an INBORN ERROR OF METABOLISM produced by a blockage in tyrosine metabolism due to the absence of a functional tyrosinase enzyme. The condition is controlled by a single RECESSIVE GENE on an AUTOSOME. Approximately 1 in 20 000 of the population are albinos. See Fig. 20 .
n hereditary condition pre-sent at birth in which the skin partially or totally lacks melanin. Congenital anomaly due to a defect of melanin production as a result of one of several possible genetic defects. Oculocutaneous albinism type 1(OCA1) is due to a genetic defect in tyrosinase, the enzyme that metabolizes the amino acid tyrosine, which is essential for its conversion to melanin (formerly called tyrosinase-negative albinism). It is an autosomal recessive condition, which affects the skin, hair and eyes. The iris is a pale colour, the fundus and the pupil are reddish and the eye transilluminates markedly. There is poor visual acuity, photophobia, nystagmus and strabismus. Oculocutaneous type 2 (OCA2) is caused by a mutation of the OCA2 ('P') gene resulting in variable amounts of melanin synthesis. The hypopigmentation of the eyes, skin and hair varies from fair to normal (formerly called tyrosinase-positive albinism). It may be associated with the Hermansky-Pudlak syndrome in which there is albinism and easy bruising or bleeding. The other type of albinism is ocular albinism type 1 (OA1). It is inherited either as an X-linked or less commonly as an autosomal recessive trait. It affects mainly the eyes and in most instances males only and the skin colour is usually normal. Management involves full correction, possibly with tinted lenses. Surgery may be required for strabismus. See ocular fundus; inheritance; trans-illumination. congenital absence of normal pigmentation in the body (hair, skin, eyes). true albinism is very rare in animals. A true white can be produced by mating two Overo horses, but the foals have congenital atresia of the colon. There is a true albino Icelandic sheep with no other apparent defects. There are a number of pseudoalbinos, one in horses being a lethal trait because of early fetal death.